They've not been holding back in any way at all when it comes to conceiving new beers over the past few years at 3 Ravens. Before heading off to become Senor Brewer at Moon Dog, the Thornbury brewery's former head brewer Adrian McNulty had been looking to brew beers that tasted like Pedro Ximenez or layering chillies onto barrel-aged beers. Since moving in, Brendan O'Sullivan has been taking things further still, not just creating the series of flavoured Berliner Weisse for sibling brewery Mash but creating the Turkish Delight English ale and a "ham and pineapple" beers for the Day of the Dead. This time, however, he may well have outdone himself. When tasked with creating a beer to tie in with The Catfish's second birthday, a suggestion that they made a gose (a salty, sour German style wheat beer) was misheard as gyoza (the Japanese dumpling) and they decided to combine the two. 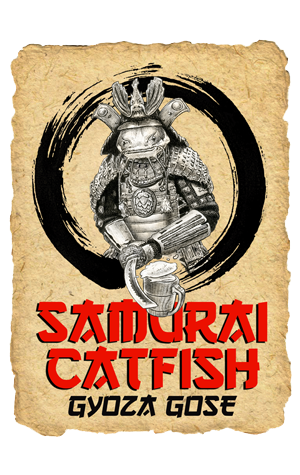 Thus was born the Samurai Catfish, a dry-hopped gose brewed with a quite outrageous list of adjuncts, plus Lactobacillus bacteria for the sourness. According to the 3 Ravens team: "The opportunity to put fish in a beer seemed like too good an opportunity to refuse. Gose is an historic German style of wheat beer related to Berliner Weisse but with a prominent saltiness and spiced with coriander seed. In place of the coriander we substituted Yuzu (Japanese citrus), wasabi (by Catfish's request) and citrus-y hops (Mandarina Bavaria and Motueka). Salt was replaced with umami – utilising the core ingredients of dashi broth: katsuobushi (dried, fermented and smoked skipjack tuna), kombu (kelp) and shiitake mushrooms as well as moshio salt (Japanese sea salt with kelp) and some 'gourmet powder'." The last of these being MSG. They continue: "A base of Vienna and Wheat Malt was mashed with the kombu (which added a distinct green tinge to the wort) followed by kettle-souring with cheese bacteria. The following day, the wort was pasteurised and flavoured with katsuobushi, shiitake (broth), yuzu and wasabi as well as Mandarina Bavaria and Motueka hops (also added later as dry hops)." It sounds, quite literally, like a mouthful and is out beyond the Catfish and its birthday venues.